Autumn arrived with a vengeance yesterday with gale-force south-westerly winds and torrential rain that fell pretty much all day. It was perfect weather for birds to drop out of the sky looking for welcome refuge. I was busy trying to finish a drawing for the Birdwatch Art competition. The deadline is next Monday and it's still not finished - it's going to go down to the wire by the looks of things. The reason? I just couldn't get my arse into gear to get on with it. I used to be a prolific artist many years ago, but these days I struggle to sit down in front of a blank sheet of white paper and put pencil to it. I think it's because I know how long it takes to put a decent illustration together. It's not a case of just sitting down for a couple of hours and... hey presto! It takes hours, and plenty of concentration. Add the fact I haven't produced any drawings/paintings for about ten years and I know I'm more than a bit rusty - which means it takes even longer. Also I keep using, as Annie puts it, 'avoidance tactics'. 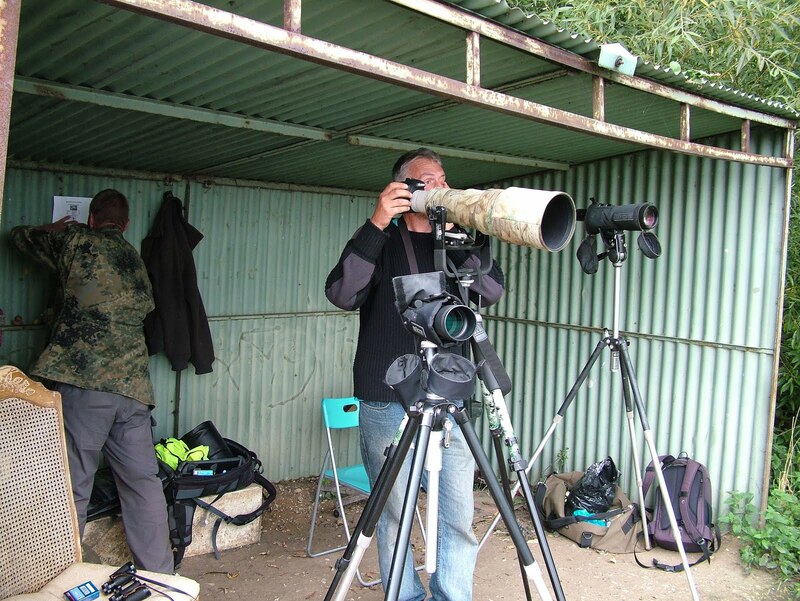 I'll do anything else to avoid getting on with it - like birding. The bottom line is if I don't think it's good enough I won't enter it. The next two days are pivotal. So what did I do yesterday? I couldn't help but pay Holmethorpe a visit in the rain. 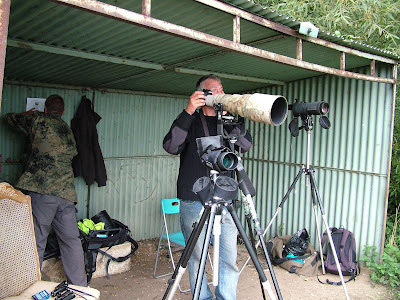 I had visions of waders of all shapes and sizes busy feeding on Spynes Mere or Mercers West. 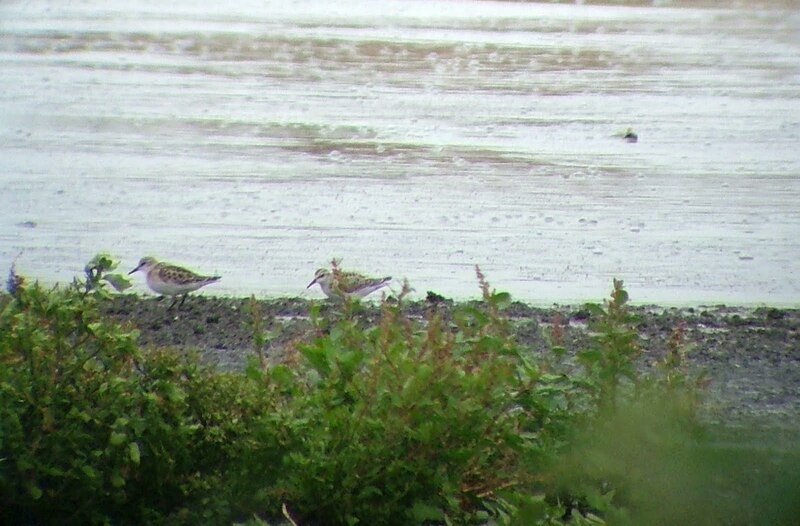 As it turned out the best I could come up with were three Common Sandpipers. Meanwhile, what a contrast at Beddington. It was raining birds up there. During the day the Tweets from Johnny Allan and Dodge were coming thick and fast. The list included a Curlew Sandpiper, a couple of Little Stints, a Ruff, a Dunlin, three Green Sandpipers, two Common Sandpipers, about 15 Ringed Plover and a couple of Snipe. Wheatear were everywhere, plus they had their regular Peregrine and Hobby visits. That wasn't all. On the gull front, a juvenile Caspian Gull dropped in, and a couple of Yellow-legged Gull were seen. This morning I had a meeting at the Racehorse Owners Association offices at High Holborn, and was hopeful I could make a detour to Beddington on the way back. The Curlew Sandpiper and Stints were still there, which was good news. 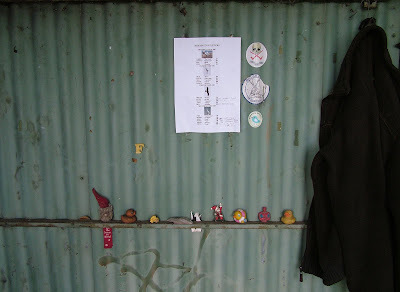 I arrived at the farm at 2pm, and was met by Johnny, who walked me over to the enclosed lagoons where the waders were. En route we saw a Sedge Warbler and plenty of Wheatear on the mound. We also met up with Roy 'Bulldog' Dennis. 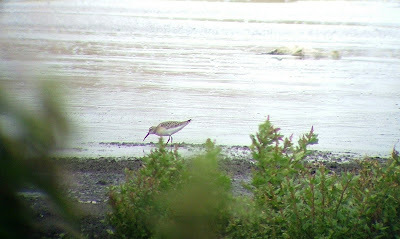 The lagoons on the eastern side of the farm were clearly proving a popular haunt for waders. 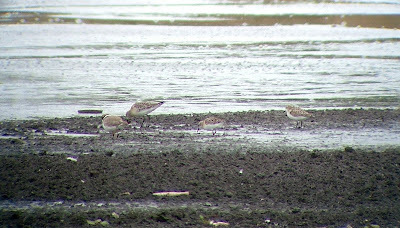 It didn't take long to get great views of the very smart Curlew Sandpiper (156) feeding alongside the two Little Stint (157). Also on the scrape were six Ringed Plovers (158) and a Redshank. 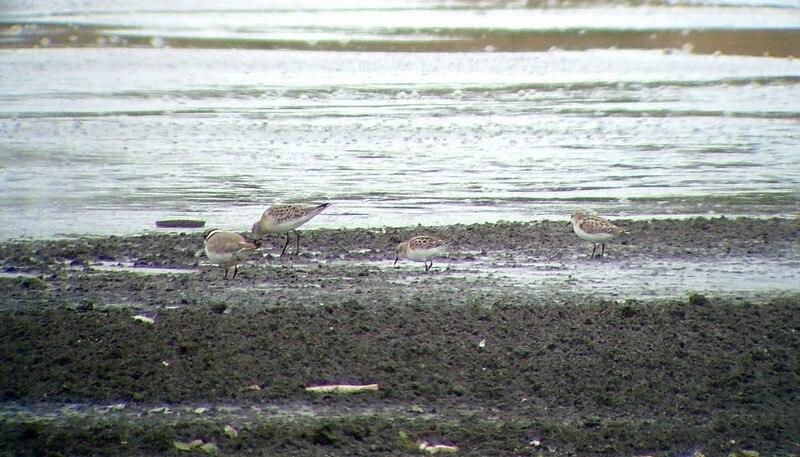 The Curlew Sandpiper and Little Stints were first-ever Surrey ticks for me, which pleased me no end. The Curlew Sandpiper, in particular, was a striking individual. Very well put together, with clean lines and excellent markings. Seeing all these unusual Surrey visitors together in one place was an excellent sight. After that, we left Roy to continue viewing and walked back across the mound - where we saw at least six Wheatear flitting around - and went back to the observation shed where we met up with Dodge. Roy joined us a bit later having seen a Whinchat on the mound. 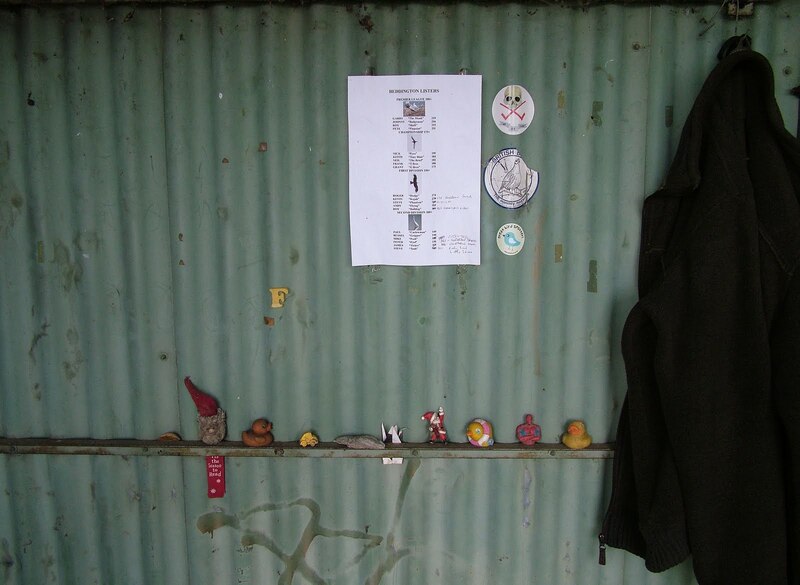 The shed is the epicentre of the site, and a welcome respite from the elements. It also features the Beddington 'shrine' which includes a number of artifacts picked up at the farm over the years, including a fossilised shell that Johnny tells me is at least 20 million years old.